Anxiety is something that we all experience at times. However, for some of us it affects our life in ways that can be debilitating. Anxiety can take many forms, including panic attacks, obsessive thinking, compulsive behavior, phobias, excessive worry, difficulties in social situations, difficulties following traumatic events, and avoidance. The therapists at the Manhattan Center for Cognitive Behavioral Therapy specialize in treating all of these difficulties. Typically CBT for these problems will involve learning new ways to deal with anxious thoughts and anxiety-provoking situations. By learning to change the way we think and what we do, we can reduce the impact that anxiety has on us. One important part of how CBT accomplishes this is through the use of personalized assigned exercises. Often, a CBT therapist will assign these as “homework” designed to help a client develop new habits and behaviors. By practicing the new skills and behaviors, they become more automatic and more comfortable. Positive change happens most often through this type of practice. Is anxiety different than fear? Yes. Fear is a reaction to a present and immediate danger, such as what we might experience when we encounter a mean-looking unleashed dog, or if we think someone has broken into our home while we are there. 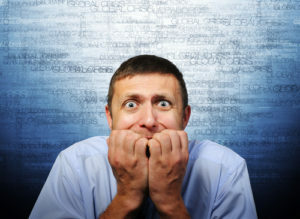 Anxiety, in contrast, is often centered on future events, e.g., “I won’t be able to pay my rent next month.” These future events are not necessarily certain — e.g., “what if I get sick next year?” or “she’s going to get mad when I start talking to her.” These worries often reflect discomfort with our inability to control these future scenarios. Treatment for anxious people has developed substantially in the past 30 years. Consequently, we now have a better scientific understanding of which types of therapies work best for various types of anxiety. We also have medications that were not available decades ago. Randomized clinical trials of CBT and of medication have greatly informed our ability to effectively treat anxiety. The first step is diagnosis. Scheduling an evaluation with a CBT therapist will provide this information and determine the best treatment options for your type of anxiety. Contact us to schedule an appointment.